A few years ago when I first got this blog started I had someone reach out asking for me to post about my collection. 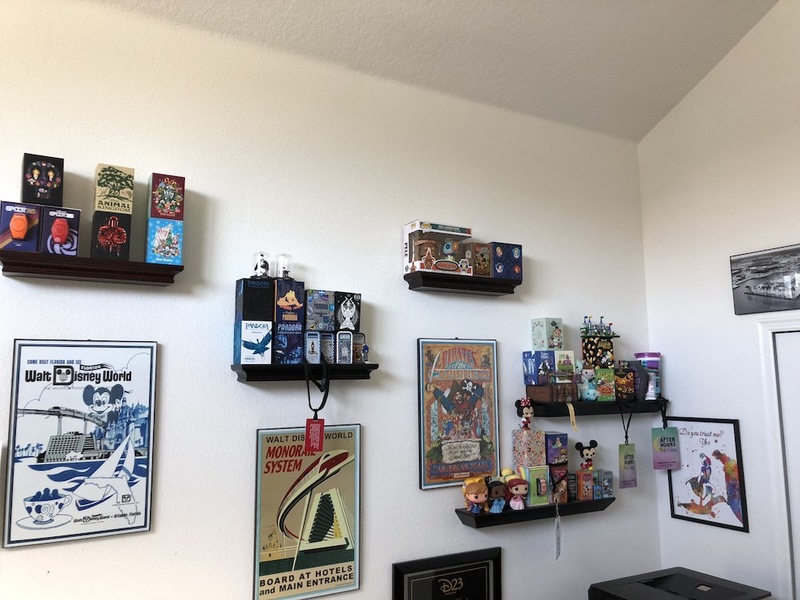 From time to time I have posted some info about how I store my collection, or how to scan pennies onto your computer but I’ve never done a full tour of my office. Lately this seems to be a topic quite a few people are interested in but to be honest I never thought it would be all that interesting. 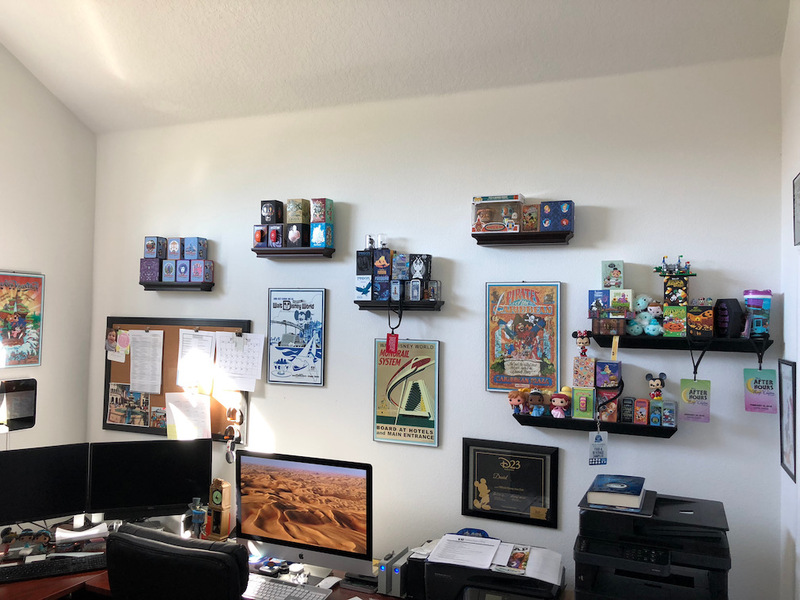 However now that we have moved to Florida the office has become a place for not just my collection, and where I write the articles, or edit the videos but now it’s also where I keep all my Disney collectibles. Hopefully this sheds a little insight into where all the magic happens. I do have a full-time job and the blog and penny collecting are just hobbies. Thankfully I’m able to work remotely and when we were having our house built we took that into account when we designed the office. This allowed for additional electrical outlets and network connections for not just the work equipment but all the personal hardware too. The office is at the front of our house which gets a lot of the Florida sunshine beaming in. 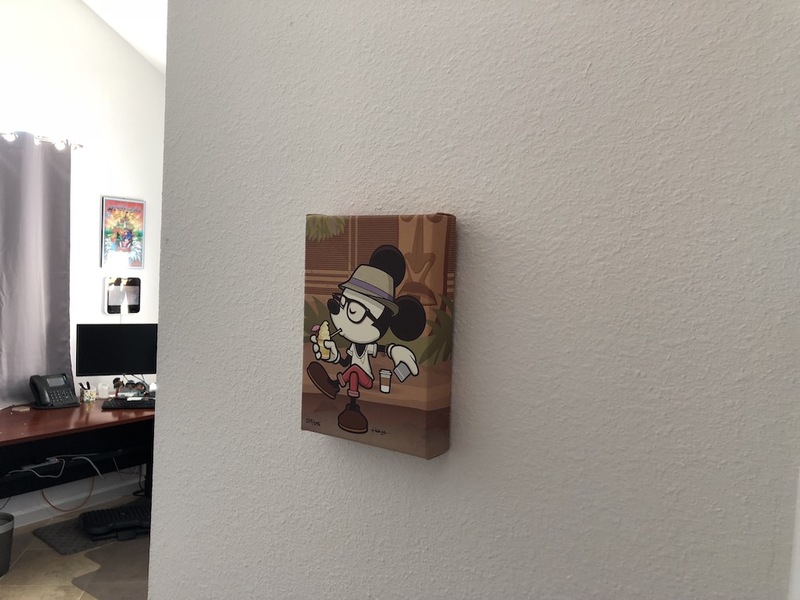 As you walk into the office my wife found me a print of Hipster Mickey enjoying a Dole Whip float which makes me smile each time I walk in. When we made our move from New Jersey to Florida along I-95 just over the border into South Carolina is the famous South of the Border. They have gift shops, restaurants and all stores of other things to do. We took the opportunity to stretch our legs and check out the gift shop. 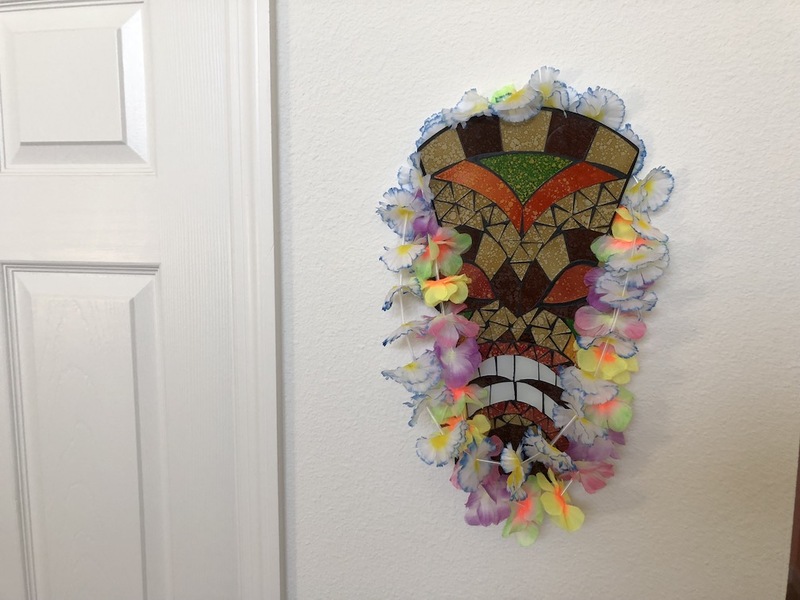 I came across this wall mounted Tiki art and just had to have it. This is also where I hang my ‘Ohana leis. 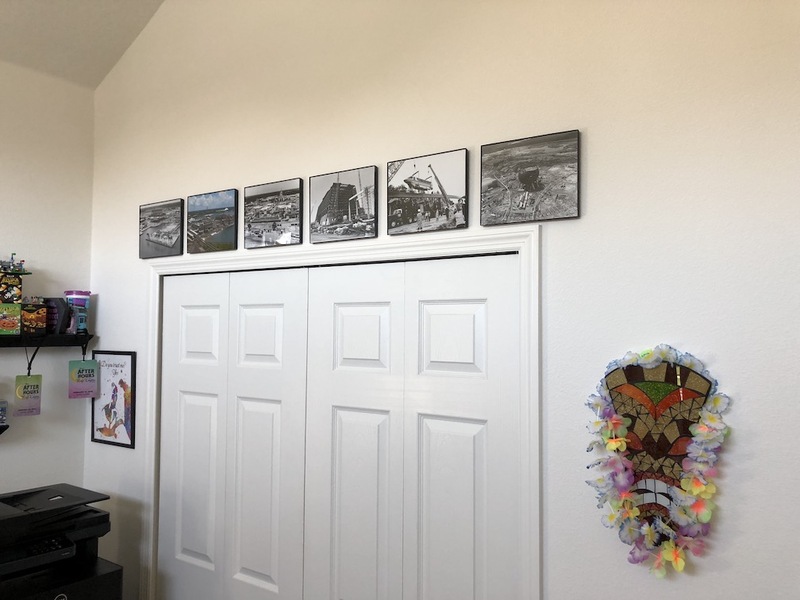 Over top of the storage closet I have some large prints of some historic Walt Disney World construction images. I always thought it was interesting to see a Monorail train being listed onto the track, or Epcot’s spaceship earth empty inside. Along the far wall are some vintage WDW attraction posters like Pirates, or the Monorail / Contemporary Resort. There are more on the other side that we will get to shortly. Then I have some floating shelves for my Magic Bands, POP Figures and other miscellaneous collectibles. If you have a sharp eye you may notice the famous “Chosen One” red cards hanging from one of the shelves, this is actually a replica I got off Etsy that I just had to have. Continuing on this side of the office is my iMac that does all the heavy workload of the blog and video editing for YouTube. The dual screens in the corner is part of the hardware for my non-penny related job. I am also a proud member of Disney’s D23 and have my membership certificate framed for display. My cork board had my calendar, TEC member cards, and our magic bands that we use primarily at the parks. One year for Christmas I was given a set of coasters that were themed after the Haunted Mansion. Each one has a different Tombstone poem from the park attraction. The one I use most of the time is “Dear departed brother Dave, he chased a bear into a cave.” Also along the windowsill is where I have my Disney Transportation collection. 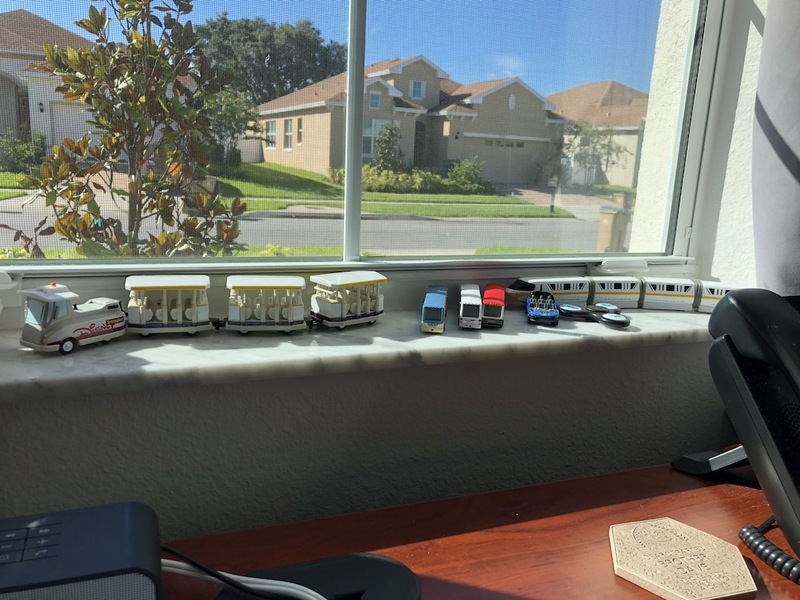 There is a scale model of the parking lot Trams, Monorail, different Bus designs, and even a small matchbox car of the Test Track vehicle. 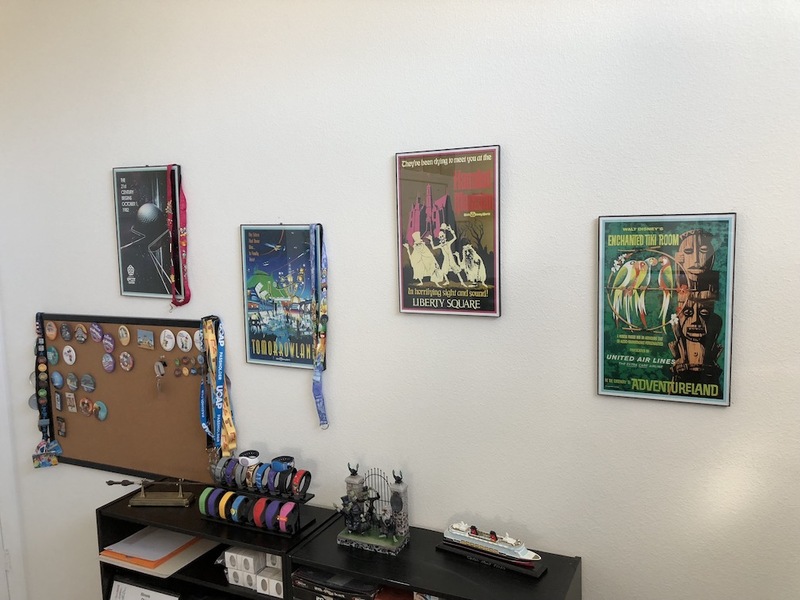 On the opposite wall are more attraction posters for Epcot, Tomorrowland, the Haunted Mansion and the Tiki Room. The larger cork board over here is where we keep a lot of our pins and lanyards from parks like Universal, Legoland and Disney Pin Trading. 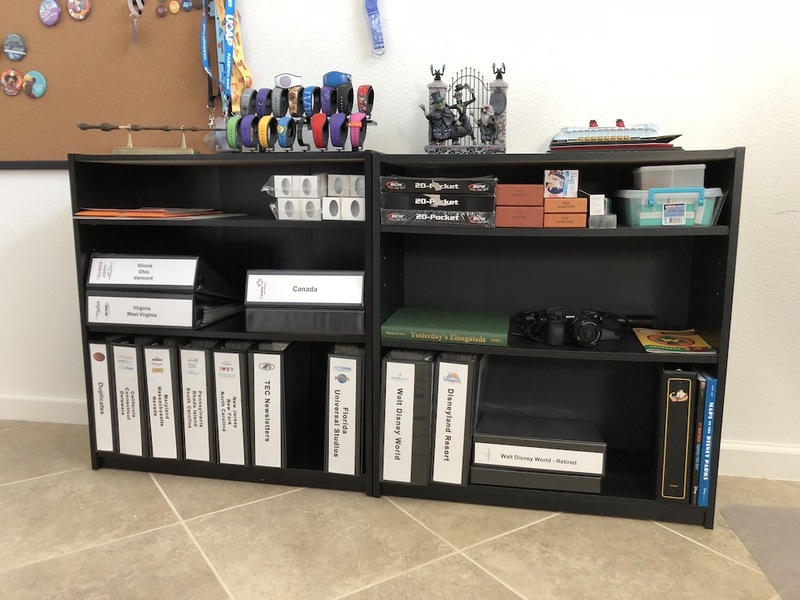 There are two bookcases here that store my frequently used equipment and supplies. There are more of these bookcases in the closet with more binders filled with pressed coins. 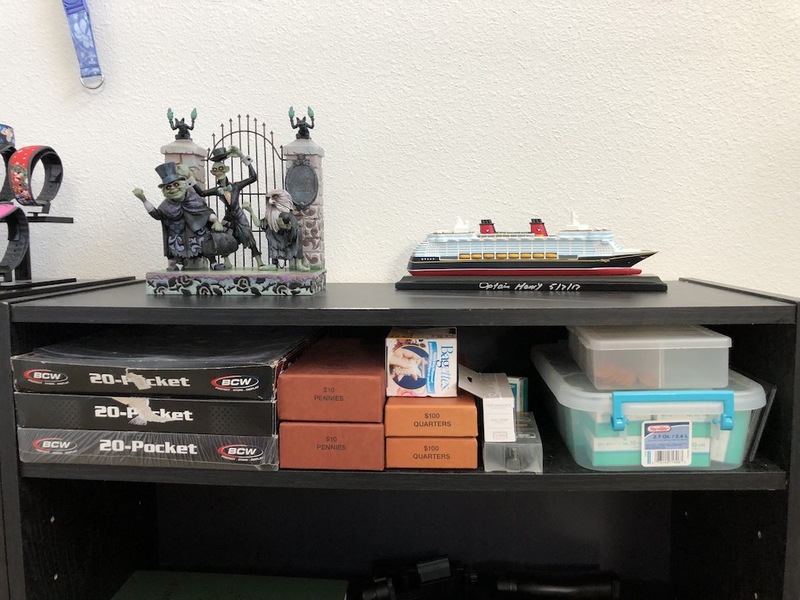 The case on the right side had my Hitchhiking Ghosts figure by Jim Shore. There is also a model of the Disney Dream cruise ship which my wife and I went on a couple of years ago. I got this model in the onboard gift shop and ended up meeting the Captain who signed it for me. Below that is where I store the 2×2 plastic binder pages that hold all my pressed coins. Next are some coin roll boxes for pennies and quarters, this helps ensure I always have plenty of change for my trips. Then there are the small plastic bags I use for temporary storage of coins I collect, a flat cinch stapler with staples, and my travel case that is usually in my car. Below that is my Yesterday’s Elongated guide which is a great resource for some older pressed pennies. There is my main camera the Sony a6000, and my daughters Wilderness Explorers guidebook from the Animal Kingdom. 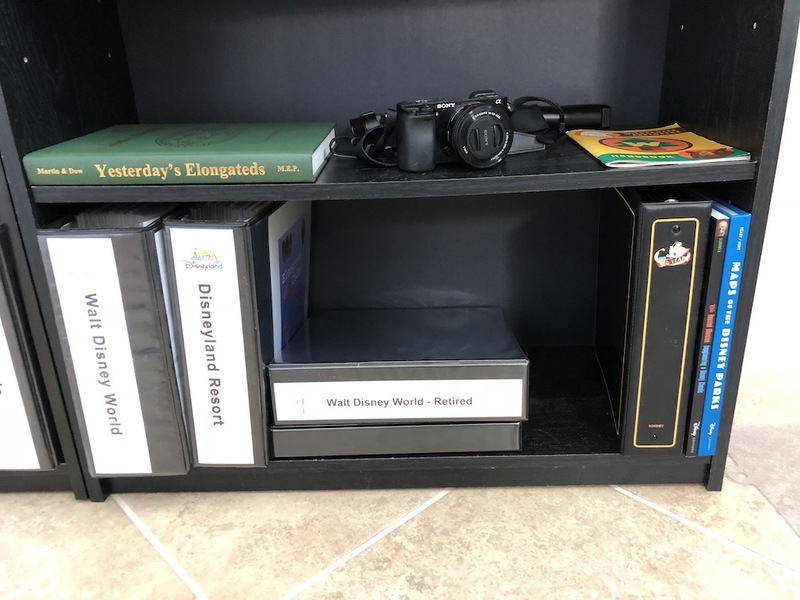 On the bottom shelf are the 4 and 5 inch three-ring binders for all my Walt Disney World coins, Disneyland coins, a separate binder just for retired WDW coins. On the right side is my Disney Pin Trading binder, and a book that has all the Disney park maps since the park opened. 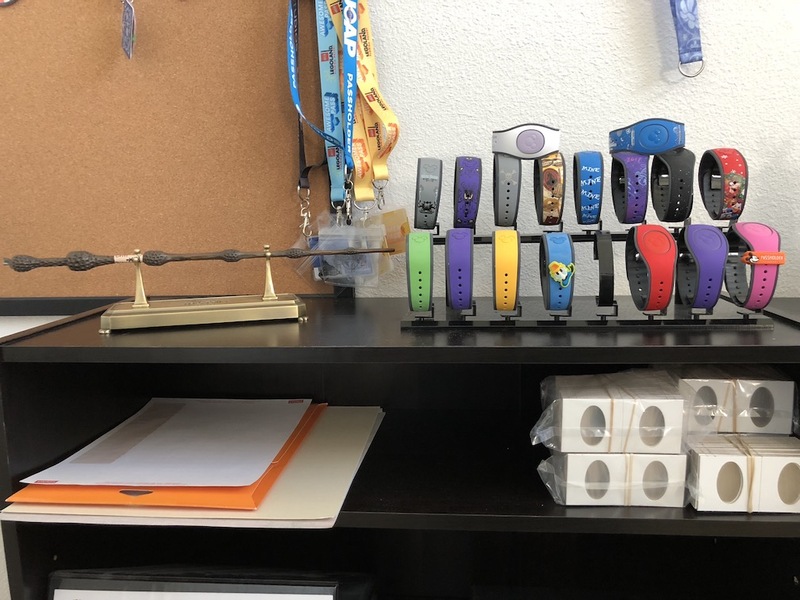 The bookcase on the left has my Harry Potter Elder Wand, and my basic magic band collection. I actually found an acrylic watch display on eBay which works perfectly for these bands. On the next shelf down I have the small labels I use for each coin, and packages of the 2×2 elongated coin cardboard holders. 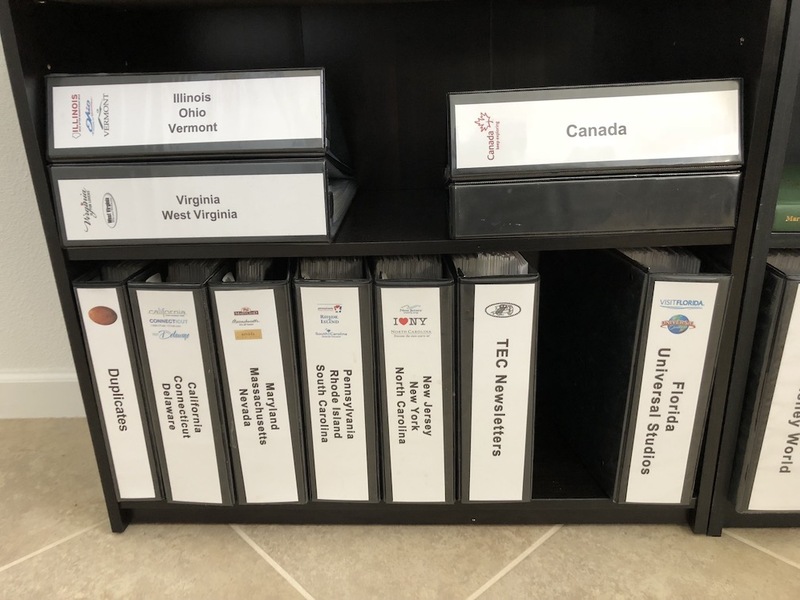 The bottom has some of the binders that store my pressed coin collection. This is my attempt to keep them as organized as possible. This is an ever-growing collection that I’ve been working on for years. I prefer to collect coins at places I have actually been to and pressed in person. But I do have a lot of friends around the country that know of my obsession and love to send me their local coins as gifts and I cherish each one of them. See what did I tell you not too exciting, but it’s where I do all the work to share this hobby with everyone. It’s my sanctuary where I can enjoy the things I love, and help keep my collection organized and from getting too out of control. Now it’s time to pull the curtain back across the room and get back to work.